Custom made burse and veil sets are available for sale from Everything Vestment in the colors of red, green, white, purple and black. 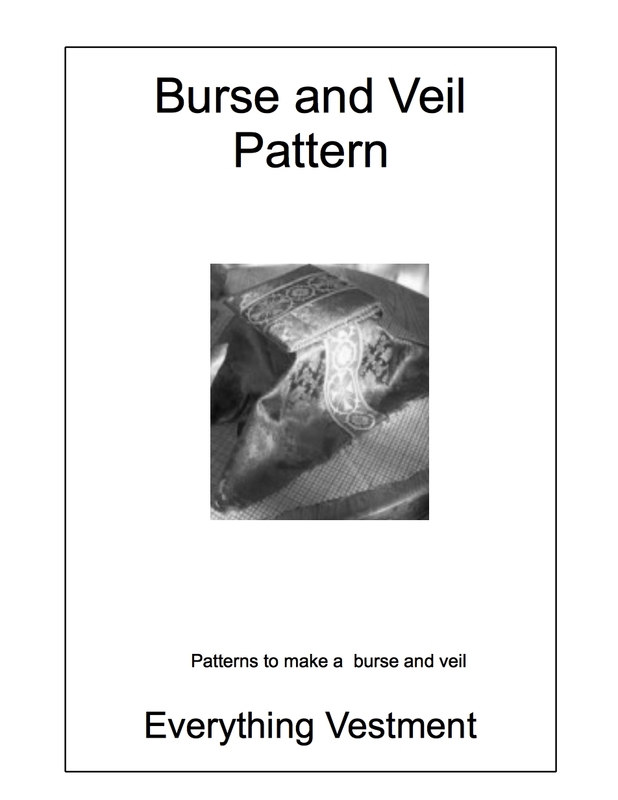 What are the Burse and Veil? The burse holds the corporal - a square white linen cloth - that is used during the celebration of Mass. The veil is set on top of the chalice and the burse is then set on top of the chalice. Learn more about the history of vestments and their purpose here. Burse and veil sets are made in colors to match the chasuble worn by the priest and are typically made in the colors of red, green, purple, white and sometimes black. This custom made burse and veil set comes in your choice of red, purple, green, white or black. The veil is approximately 25 by 25 inches while the burse is approximately eight inches square. Fabric is rayon brocade. If you have sewing skills you can make your own set and save money. You can find a pattern here. You can also find step by step instructions on how to make a burse and veil set by clicking here. We offer liturgical fabrics for sale in the colors of red, white, purple, green and even black as well as matching trims and crosses. Our fabrics are both beautiful and affordable. You can learn more about them here. 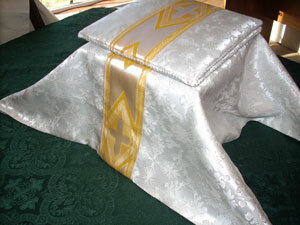 You do have to have sewing skills, but you can save money by making your own burse and veil set, chasuble or stole. You can learn sewing tips from our expert seamstress Lynne Green by clicking here. If you have a unique, custom-made item you haven't found listed on these pages, just contact us by clicking here. We'll be happy to create an item to suit.